Coconut is high in fat – this is a fact. Hence, Coconut often gets bad publicity. Recently, Coconut has become a new old-super-food, thanks to the latest research studies. What is amazing about Coconut is that Coconut milk remarkably resembles human mother’s milk. This is due to lauric acid, which is found in both coconut milk and breast milk, and helps to protect babies against microbes. Coconut is called ‘Tree of Life’ by Pacific Islanders, as Coconut is a source of food and medicine for them. It is claimed that Coconut oil is a good antioxidant product. It’s not only resistant to the formation of free radicals but it also removes those free radicals from the body. Coconut oil also stimulates the thyroid, reduces stress on the pancreas and liver. Hence, increases metabolism. And most characteristically, Coconut oil increases the levels of energy due to its special digestion. The magic of Coconut oil is in its short-medium chain fatty acids. The short-medium chain fatty acids are absorbed directly into the blood via intestine capillaries and travel through the portal vein to the liver. And the liver is the first organ to absorb nutrients just taken in by the intestines. This means that saturated fat in coconut oil can go through cell membranes and carry special proteins. In the liver they are converted to energy instead of being stored with no stress on pancreas. This is why coconut oil is digested easy by most people as opposed to other oils containing long chain fat acids that can damage the liver and very difficult to metabolise. They say coconut oil can be digested even by people whose gallbladder is removed. Coconut water is almost identical to human plasma. It was even used intravenously to save injured soldiers during the second world war. Recently, there was a research study that compared coconut water from Immature, Mature and Overly-Mature coconuts (Food Chemistry, Volume 142, 1 January 2014, Pages 121-128). The study found that although the amount of water and aromatic qualities reduce with maturity, the mineral contents increase. Lately, Coconut water is heavily promoted as a good rehydration therapy. There are also claims that it reduces water retention and keep skin smooth and hydrated. So, maybe next time when we go to the local chemist to buy Hydrolyte , we should buy Coconut water instead. 1. Soak agar for Panna Cotta in coconut water in one saucepan. Soak agar for topping in cherry compote in another saucepan. 2. By using a silicon spatula constantly mix coconut water with agar on medium heat until the agar dissolves and the mixture is clear and consistent. Add sweetener and continue mixing until the mixture becomes thick and clear. 3. Slowly pour coconut milk and continue mixing until the mixture is very smooth. 4. Add cream and continue mixing until the mixture is consistent. 5. 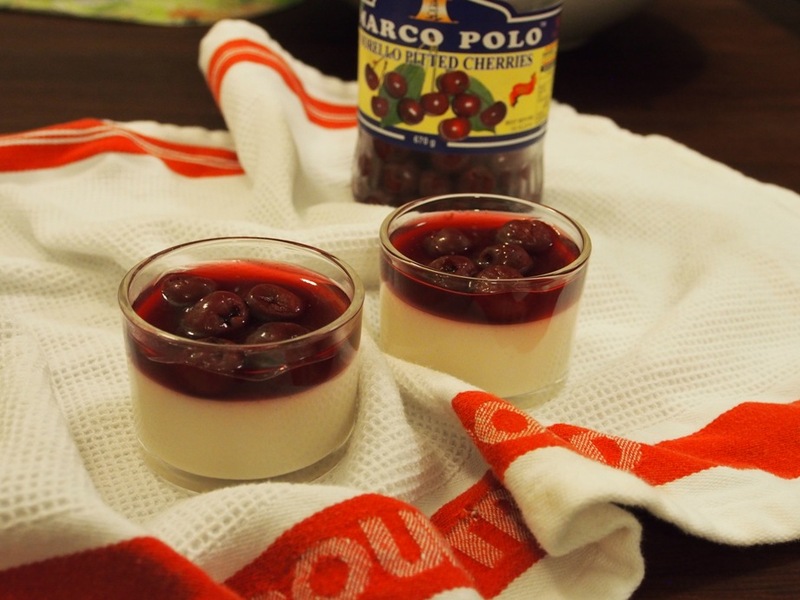 Divide between the serving glasses or forms and let the Panna Cotta set in the refrigerator for a few hours. 6. When the Panna Cotta is set and the surface is firm, put compote with agar on medium heat. Mix well using a silicon spatula until the agar dissolves and the mixture just starts boiling. Switch off the flame and let it cool for 5-10 minutes. 7. 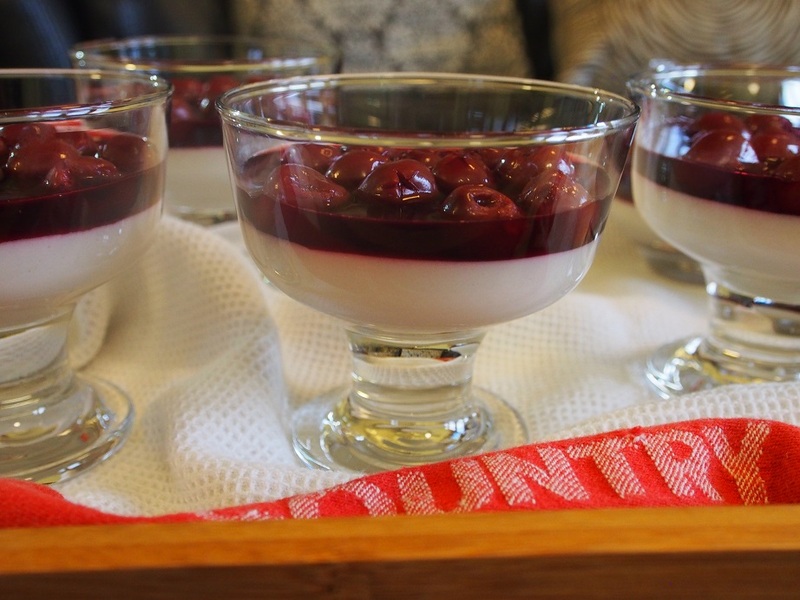 Lay cherries out on top of each Panna Cotta serving and pour the compote mixture over. Put back into refrigerator until the serving time. 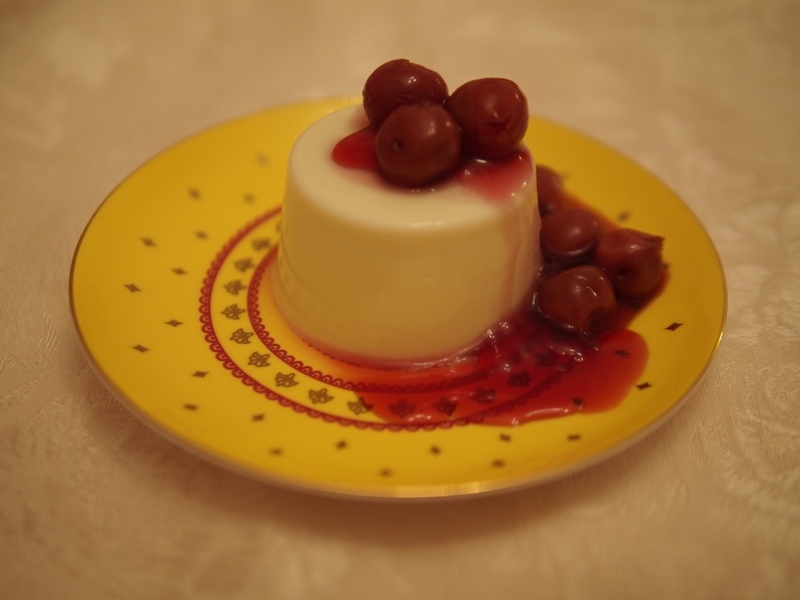 If you like to serve Panna Cotta in a traditional way, you can easily turn it over onto the serving plate once it is set well. Then you will need to pour the cherry topping over very slowly, probably in two batches. It might take a few minutes to get the first layer set.